(White Plains, NY) Calling all high school aspiring singer-songwriters! Do you write lyrics and melodies in notebooks? Play an instrument and want to make your own music? 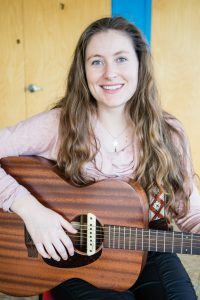 You can learn how to successfully put those elements together with training from the new Singer-Songwriter Program at the Music Conservatory of Westchester in White Plains. As part of the nonprofit community music school’s Jazz/Rock/Pop Division, the Singer-Songwriter Program adds Frabotta to the Conservatory’s roster of more than 80 expert faculty members. Her most recent album titled “Who We Are” was self-released in October 2018 under the stage name Mosa. She has performed her original music at Rockwood Music Hall, The Bitter End, Mercury Lounge, and other notable New York City music venues, and has toured for performances in such major cities as Nashville, Philadelphia, Boston, Washington, DC, and Montreal, QC. Frabotta’s recording experience spans from solo recordings and producing, to vocal session work for various songwriters around the New York Metropolitan area. The Conservatory’s new Singer-Songwriter Program is now open for enrollment! Contact the Music Conservatory of Westchester at 914-761-3900 or [email protected] to get started! For more information about the Music Conservatory of Westchester, please contact Adriana Rivera, Communications and Development Assistant, at [email protected] or 914-761-3900 x135. This entry was posted in Press Releases and tagged Class, Melissa Frabotta, music, Music Classes, music conservatory of westchester, Singer-Songwriter, Songwriting, white plains. Bookmark the permalink.